September 2014. 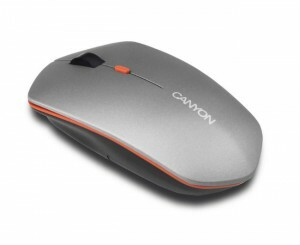 Latest flat iron gray mouse presented by Canyon in the transparent «360 View» box will give you feeling of airiness. It has 2,4GHz wireless technology for reliable connection to avoid delays or dropouts, additional On/Off switch and power saving technology. The mouse is perfectly compatible for both Windows and Mac OS. It’s controlled by 6 buttons for sensitive switching, 2 of which can be programmed. Two batteries of AAA class will let it run up to 6 month. The mouse has additional On/Off switch and resolution up to 1280 dpi. Performed in deep soft colors.